I reach out and give it another push. It spins idly, in slow rotations on the desk. Dentine against toughened plastic makes an empty, clinical sound. The enamel coated tip is whiter. Sharper. The business end (a thickly curved point) is covered in light cracks – like the crazing that forms on coated pottery. In an unlikely collision of worlds, the fluorescent light of my office is glaring down on two objects side by side: An Apple Mac and an orca tooth. This talismanic thing – an item that nature nerds live and die with the dream of finding – has taken me on a twenty-four-hour voyage of desire, triumph, and ultimately disappointment. Under a pall of Hebridean water, Scotland’s most magnificent clan is sliding towards extinction. It is a thought that keeps me awake at night: the ardent hope, the all-consuming wish that one day, I might be fortunate enough to catch a glimpse. Before the last of their yellowing bones wash ashore, and our only resident orcas are finally and dreadfully consigned to the history books. In life, these animals ooze easy grace, charisma, and glittering alien intelligence. Their sad future of impersonal text and numbered photographs couldn’t make for a more wretched contrast. I am well known (and rather mocked) for my love of birds. So, it was surprising just how much the tale of the West Coast Community fired my imagination when I moved to the Hebrides. W01 – “John Coe” – is the individual that I wish to see above all others. His tattered dorsal fin is the pirate flag of a whale killer. 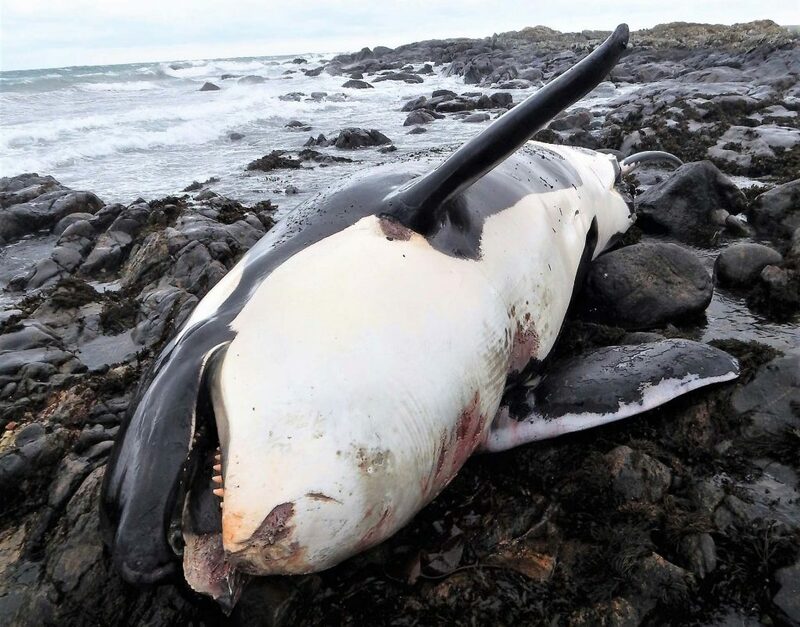 He and his family are the true embodiment of their name; feeding on other cetaceans (Harbour Porpoise and Minke Whale), rather than on seals or fish as other tribes do. There are only eight of them left now, and as a family they are unique in the world. For the West Coast Community, our ocean is a lonely place. 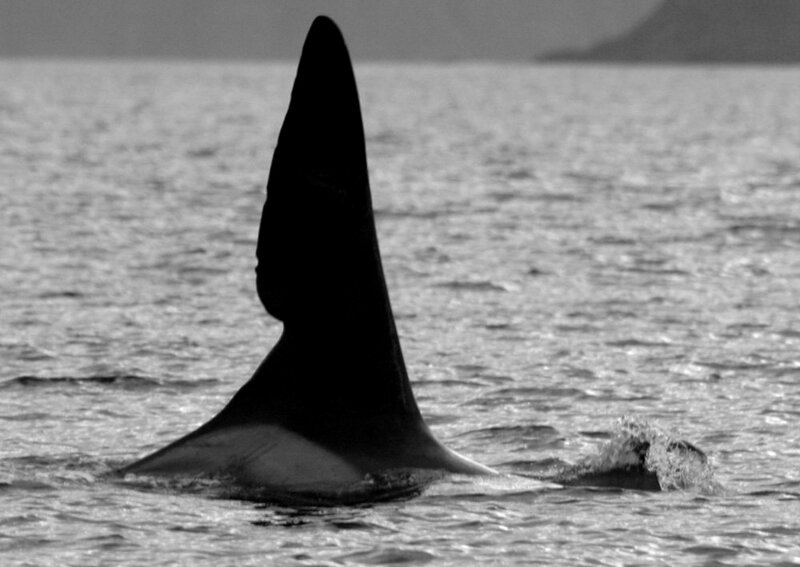 They are culturally distinct from all other orca that visit Scottish shores – and there are no other families of their own clan left here for them to interact with. Startlingly, it seems that our resident orcas are more closely aligned with populations that inhabit Antarctic waters, than the smaller migrant Icelandic animals that summer here. 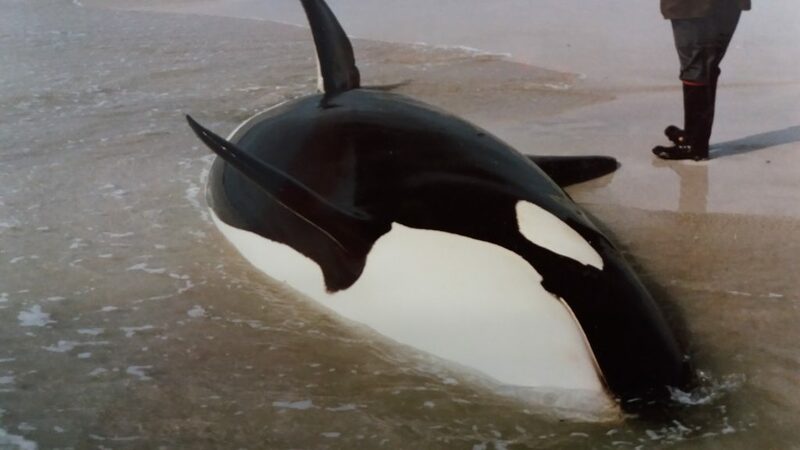 Since meaningful attempts to document this family began with the Hebridean Whale and Dolphin Trust (HWDT) in 1992, they have not been blessed with any known offspring. They are alone and ageing, on a doomed evolutionary limb. John Coe is an icon. Instantly recognisable, he wanders British seas like a colossal piebald unicorn. So, whether I’m struggling out of the Co-op with heavy bags of shopping, driving home from work in the late afternoon sunshine, or enjoying a mug of hot chocolate on the ferry – my eyes are strapped to the horizon on a quest for isosceles triangles. Tiree was thrust into the saga of the West Coast Community in January 2016. On the rocks that I drive past twice per day, the monochrome carcass of W06 – “Lulu” – reached its final resting place. Deep lesions on her tail-stock and water in her empty stomach spoke of entanglement; the exhausting, creeping despair of a death by drowning. The carcass of W06 (‘Lulu”) which was discovered in January 2016 at Crossapol (Photo Credit: Dr John Bowler/RSPB). If you look at her tail stock and flukes, you can see deep linear abrasions. These are likely caused by rope, which would have rubbed away skin and tissue as the animal strained against them. Sadly, it seems the whale dragged this gear behind her for some time (Photo Credit: SMASS). Media coverage of this stranding gained momentum following chemical analysis of W06’s remains. 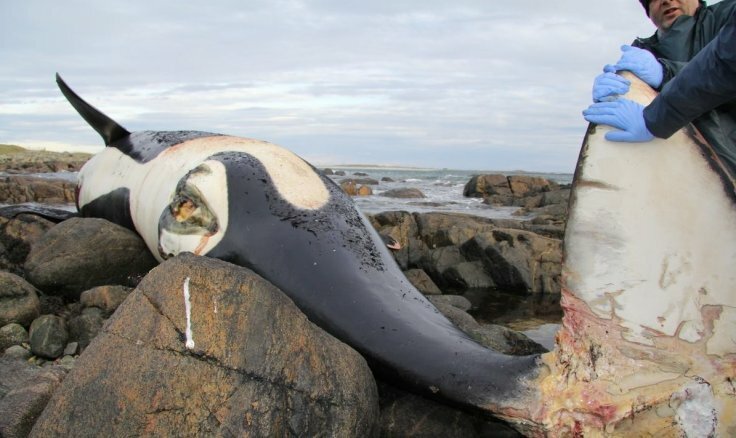 Everyone from the WWF global media department to grannies in the knitting circle talked about a whale so polluted, her carcass had to be treated as hazardous waste. 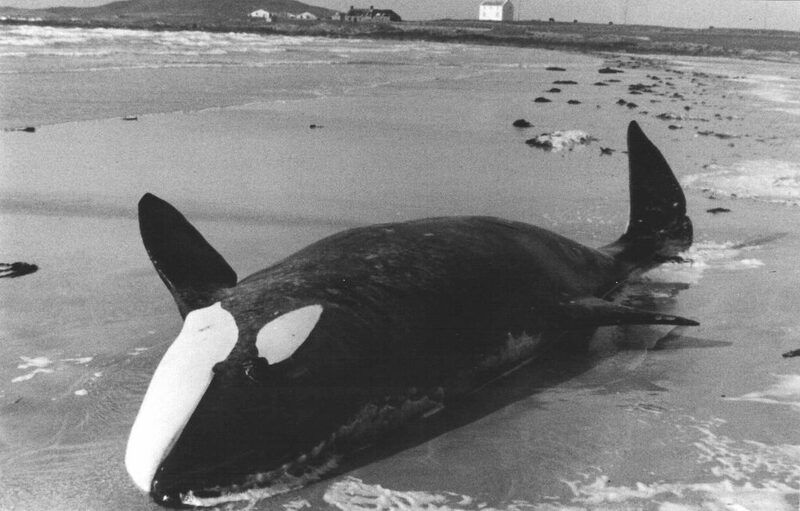 Tiree’s toxic orca even featured on The One Show – an unenviable accolade, if ever there was one. It was at this time, from my home on Mull, that I first saw the other picture. I was keen to follow the discussion generated by W06’s demise – and had been Googling accordingly. The picture was taken in black and white; oddly enough on the same beach as W06, which helped it to stick in my memory. This photograph – which instigated the whole saga – forms part of the An Iodhlann museum archive. (Photo Credit: Dr John Holliday). I highly recommend passing a quiet hour on their website [see here]. It’s a treasure trove! Exactly one year after the orca stranded, I found myself working on Tiree. There could scarcely be a better place to live if you have an interest in cetaceans. Since my arrival, I have been trained as part of the Scottish Marine Animal Stranding Scheme (SMASS) [see here] to take biometric data from stranded carcasses and to send tissue samples away for analysis. I have also been trained to survey for living whales and dolphins in collaboration with Whale and Dolphin Conservation’s ‘Shorewatch’ initiative [see here]. Life is pretty interesting, you might say. Part of my work involves collaboration with other local organisations. Last week, when back home briefly in Tobermory, I had a meeting with two members of staff from HWDT. They are leading a new project which plans to explore the rich culture and folklore surrounding whales and dolphins in the Hebrides. It’s called the Hebridean Whale Trail – and we’re going to be a part of it [see here to keep an eye out for the project launch]. Karl and Siobhan had already visited Tiree (I was away at the time) and were extolling the virtues of our excellent island museum – An Iodhlann. They mentioned seeing photographs of a Northern Bottlenose Whale that had stranded in the 1930’s. 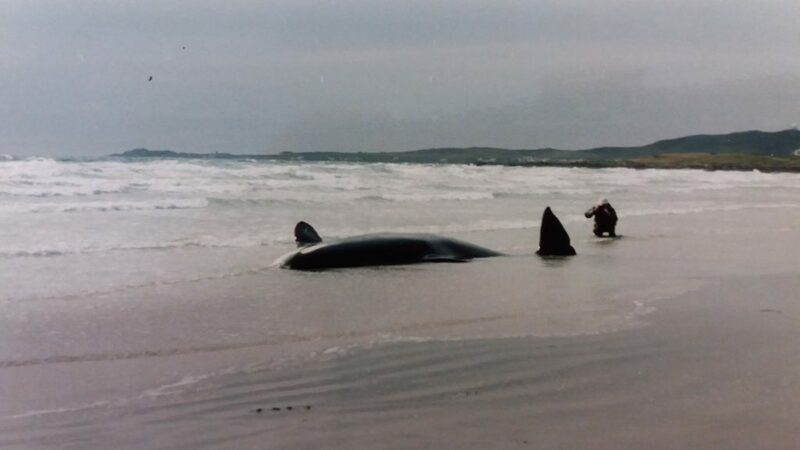 I asked if they had also seen the photograph of the earlier orca stranding, and the answer was ‘no’. I’m not the most mentally agile person. After a year of carefully measuring and chopping up deceased marine life, the idea that the orca from the older photograph might not have been recorded had never fully crystallised in my mind. As it was on the internet, I suppose I’d sort of… assumed. Hunched next to a small heater on a wobbly chair in the HWDT office, the penny finally dropped. I had to leave for a wedding the following day; as soon as I got chance, I emailed the photograph to my SMASS coordinator. Blinking dimly at the screen, the tantalizing possibility dawned on me that – just maybe – this animal could be an unidentified member of the West Coast Community. One of our own. The following morning, at a disgustingly early hour, I boarded the ferry back to Tiree. When you live in such a small and remote outpost, you never travel alone. On this occasion, Dr Holliday hailed me from his seat at the top of the CalMac staircase. Dr Holliday manages our island museum with irrepressible enthusiasm. 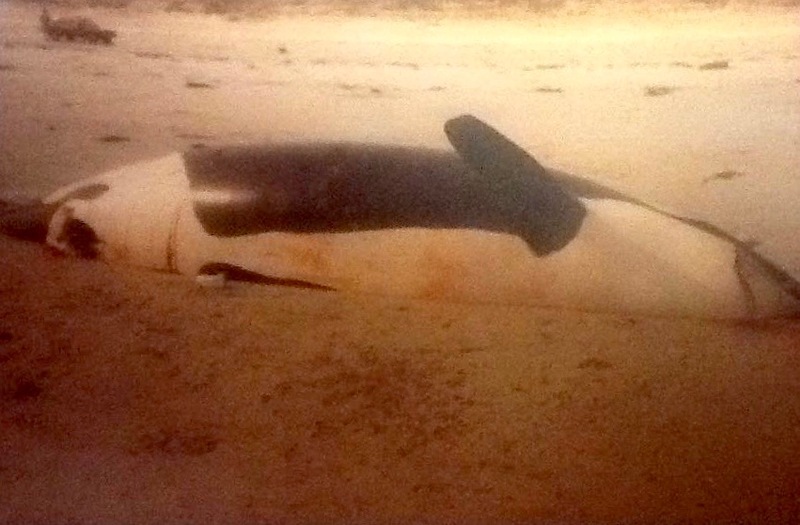 In order to try and find an exact date for the historic stranding, I asked about the photograph. I should have known. In the same way that once you go south of Bristol all roads seem to lead to Taunton, Doc. Holliday is invariably front-and-centre of any remotely interesting occurrence within our community. Of course: He’d taken the picture himself. With a flush of excitement, I asked what had happened to the carcass. Well, in 1989 things were a bit less scientific. 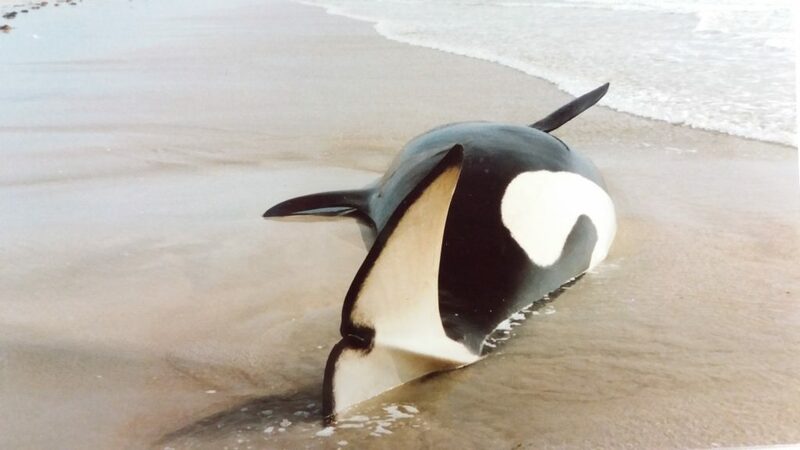 After causing a brief flutter of curiosity among island residents, the offending orca was solemnly dragged to the dune head and buried. No fuss. No media. No WWF (though, the event probably did make the headlines of the knitting circle, and one lady wrote a poem). At those fateful words, Whale Quest commenced. Was the skeleton still snug within the dune? SMASS were keen to know. Indeed, if it was, the National Museum of Scotland might schedule in a little visit during their next collecting trip. From ground bone, you can collect DNA. From the wear pattern on teeth, you can make an informed guess about diet and prey preference. From ear bones, you can spot small physiological differences between quite closely related animals. Globally, it’s thought that different orca clans (or ‘ecotypes’) result from population radiation – followed then by the exploitation of distinct ecological niches, the creation of distinct behaviours and culture in response to these niches, and finally the complete genetic isolation of these disparate groups. Orcas may look much the same to the casual observer; but two ostensibly very similar animals could have a genetic history that diverged 200,000 years ago. They are unlikely to interact at all – let alone breed together. They have a totally different heritage. Even their language is different. Using our island Facebook page, I managed to recover additional photographs of the 1989 animal – in colour, this time. It was amazing how many people remembered going to see the carcass. However, with this, came fears that both skeleton and dune had been reclaimed by the sea during a ten-week long battering from winter squalls. You can see how fresh this carcass was when it first arrived (Photo Credit: Dr John Holliday). From this angle at least, there is no evidence of rope abrasions on the tail stock. Indeed, the animal seems not to have a mark on it (Photo Credit: Dr John Holliday). So far, this is the only photograph of the whale’s underside that we have (Photo Credit: Monica Smith). By this point, the carcass must have been there a day or so – as we are starting to see evidence of scavenger activity. This photo shows the size of this animal quite effectively. When I photograph standings events for SMASS, a wide-angle shot is important; helping experts to decide whether the animal arrived alive or dead, judging from its position on the shore (Photo Credit: Dr John Holliday). I asked after exposed bones, thinking that local residents might have had an interest in picking them up. My first email returned the skull of a Leatherback Turtle among other treasures, but no known orca parts. My second held the promise of ribs in a loft – maybe – but jumbled with countless other such finds, and unlikely to emerge any time soon. Outside, the weather whipped past the window and peppered the glass with hailstone shot. On Crossapol, white caps were blowing backwards out to sea. A visit to the dune would have to wait. My fingers drummed irritably on the desk. Then, like the light that illuminates the path to mecca, a memory of one of my first days at Tiree Community Development Trust floated out of the midweek gloom: The Dinosaur Tooth. I can only assume that Louise, Donna and Shari knew me for the nerd I was right away. After a few days of tentative ‘new person’ office chat, they collectively decided to bring out the big guns. With great pomp and circumstance, The Dinosaur Tooth was removed from Shari’s top drawer; where it lived mostly unmolested with loose staples, bits of fluff, and stray elastic bands. At the time, I think the streak in Shari’s hair was cerise pink. As this relic was handed over, I got the feeling my reaction was being carefully monitored – to ensure that I was suitably impressed. And I absolutely was. However, it’s a sad fact of life that being impressed by something often means that you don’t know much about it. The item had been described previously as a seal tooth (bloody big seal, I thought) and after a muted and respectful passing about, was returned safely to its hiding place. Almost without realising it, my bottom was levitating anxiously from my office chair. My fingers had started to twiddle like they were playing an imaginary piano. With some alarm, Shari noticed my face looming urgently above the blue upholstered divider that separates our desk. The drawer was opened. It was the tooth of an orca. The tooth had been collected by a previous member of staff from Crossapol beach in the early Noughties (so, well before W06 met her maker). I just could not believe my luck. That, and my utter stupidity for not thinking of it earlier – but best not to dwell, eh? A ruler was found, photographs were taken, and I waited smugly for acknowledgement of this major coup. The emails went quiet for a few minutes. A nervous tick started in my left eye. Gmail pinged, and I could hardly open the message fast enough. Yes! SMASS said. The tooth was definitely from an orca! …but without irrefutable proof that it originated from that specific carcass, there was no point whatsoever in examining it. Better luck next time, old chap! My howl of defeat was probably heard in the Faroes. I mean, what are the chances. The likelihood. 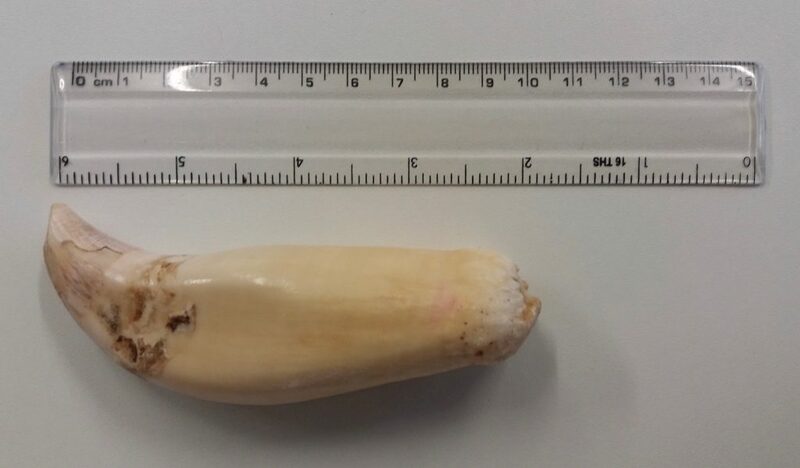 The PROBABILITY that this tooth arrived on the exact same beach, from another animal, of a species that is harder to find around here than a black cat in a coal cellar? This experience summarises why I have stopped trying to identify as a scientist. I’ve come out: boldly casting away my callipers and ready to admit that I’m more Dreamer than Data. I just can’t live like that. The festive season looms. On average, I’m still running through two full boxes of Office Depot. tissues per day. I might have lost the first battle – but ladies and gentlemen, this isn’t over. I’ll be seeing you on that beach in January.